These quality white 2ply soft Kimberly-Clark hand towel rolls are ideal to use in busy washroom areas with the Kimberly-Clark automatic hand towel dispenser. 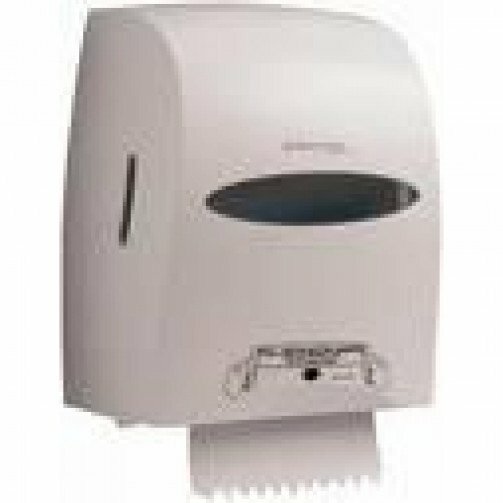 This Kimberley-clark high capacity, hygienic, and cost-effective hand towel dispensing system is ideal for use in high traffic areas. The Kimberley-Clark dispenser is designed to meet the increasing demand in hygiene for non contact towel dispensing systems, the 'No-Touch' dispenser is completely self contained and does not require mains or battery power supply. The unique dispensing system of the Kimberley Clark unit means the towel is only touched by the user, a fresh clean sheet is supplied every time. The rounded, sturdy ABS plastic cover meets the demanding hygiene standards for smooth, easy contours free from dust trapping crevices and the sloped top is to prevent itmes being put on them. This Kimberley-Clark dispenser has a easy loading system and stub roll facility means less waste, constant availability with reduced maintenance time and costs.